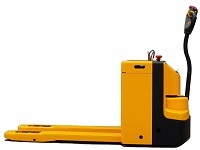 Electric Pallet Truck - Products - SINOLIFT MATERIAL HANDLING EQUIPMENT CORP.
A electric pallet truck is a kind of powered pallet truck using an electric motor to move and transport pallets, it is applicable to the medium or long distance hornized transport and unloading, and can largely improve pallet transporting efficiency. 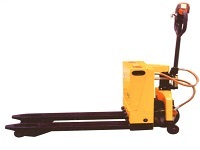 However, it can not be used to stack goods. 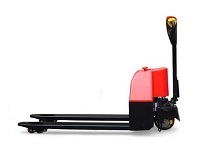 Electric pallet truck is usually designed with ultra thin, firm truck body, it has the advantages of small turning radius, no noise or other population, easy operation, high flexibility, and high working speed, etc. its large capacity accumulator can work for a long time after every charging. 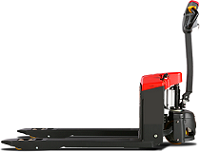 Its motive power can be electric drive, diesel fuel. Gasoline and ligquefied pertroleum gas . 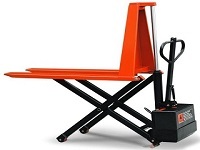 its driving model can be manual type, walkie, stand-on type, sit-on type and picking type.